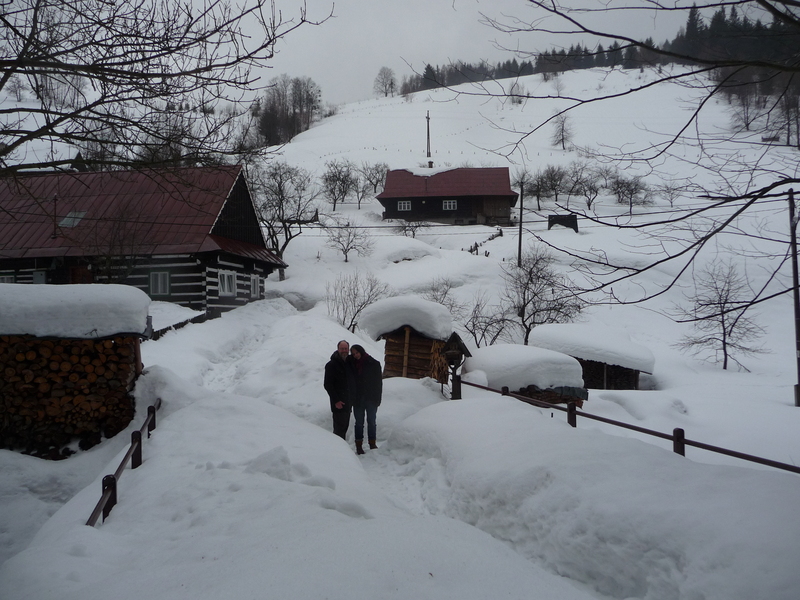 On February 24, Petr and Lenka took us from Ostrava to my grandmother’s village of Horni Lomna in the Beskydy Mountains near the Slovak border. I have such scanty information about her life before my father was born to her and her second husband in Drumheller in 1926 but I’ve always known where she came from, and when she was born — 1881, though her naturalization papers say 1883; I will believe her birth certificate which accords with my father’s memory… When my father died in the fall of 2009, my mother gave me a small bundle of papers which included these things and after her death in 2010, I found a few little bits and pieces, including this photograph of my grandmother, Anna Klus (or Anna Klusova as she would have been here), with her first husband, Joseph Yopek. 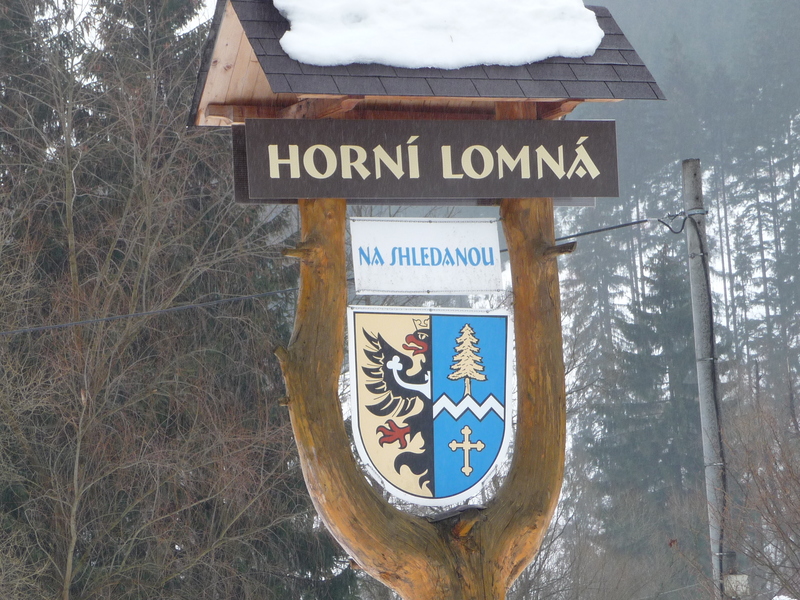 Horni Lomna is a village of fewer than 500 people. At the village office, the mayor’s assistant explained to Petr where the house, number 26, was located. 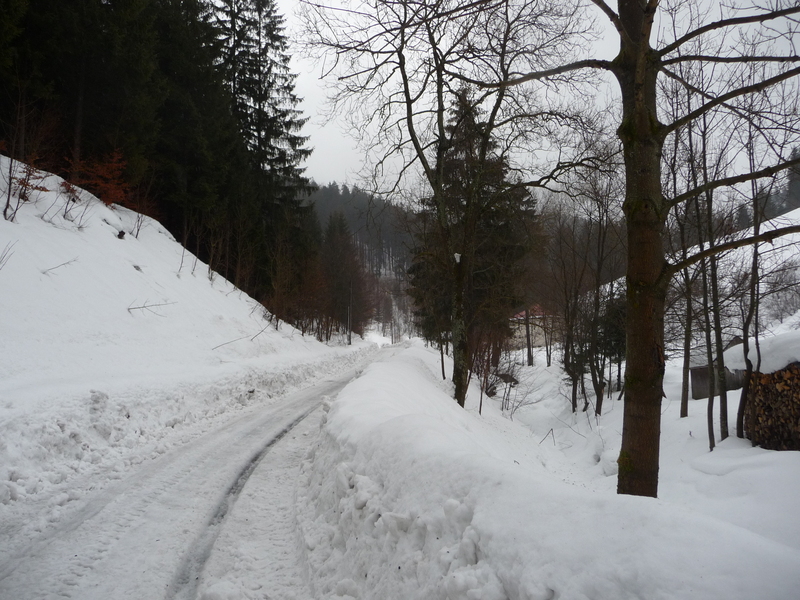 We couldn’t drive — the road was deep with snow. So we left the car and began to walk. The village was strangely familiar with its wooden houses and tall conifers, mostly spruce, and a skittering of small birds. We’d been told to take a road that veered off the main one and we were to watch for a bridge over the Lomna River (Horni means “upper”; there is also a Dolni, or “lower” Lomna, nearby). We wouldn’t be able to get right up to the house (no longer occupied), the woman had explained, because of the snow, but we would be able to see it from a neighbouring house. I thought of my grandmother walking this road — to school, to church, to her wedding to Joseph Yopek, and perhaps even after saying goodbye to her parents in 1911 before she left with Joseph and their five children (four more would follow) for Antwerp where they boarded a boat for North America. And then we saw her house. Every winter it would have looked like this, tucked below its hill in the narrow valley of the Lomna River, not far from its headwaters. Those are fruit trees around it, but what kind? Plums? Apples? Her birth certificate tells me her father was a farmer so there would have been crops of some sort and this is sheep country so no doubt they would have raised sheep and maybe a pig or two. So much I don’t know, and perhaps never will. 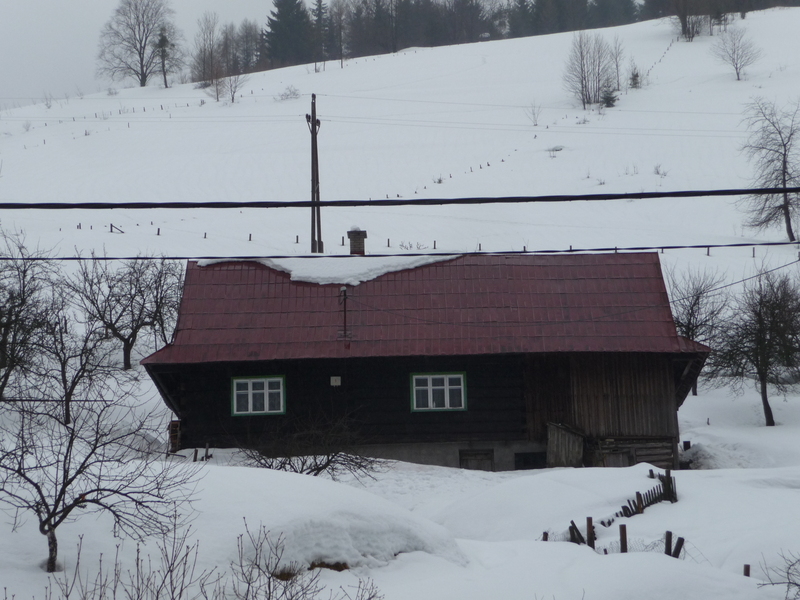 But seeing this house, in snow, gives me a sense of where she began, and in a way it’s where I began too. Walking back, we heard churchbells announcing noon. The same churchbells, the same road, the deep snow carrying the sound as far as the heart can travel. ~ by theresakishkan on February 26, 2012. Lovely! what a marvellous opportunity for you. It’s wonderful to see this pictures, Theresa. Thanks so much for sharing them. Interesting and fun to think we both hail from sheep country. My dad used to tease my grandma and mother, saying they were descended from sheep stealers and border creepers. Thanks for your great pictures of Horni Lomna. I’ve been researching the area, since my great-grandfather was born and raised there (around the same time as your grandmother, probably. Josef C. Brozda, emigrated in 1913). Oh, I’m so glad you found that post. 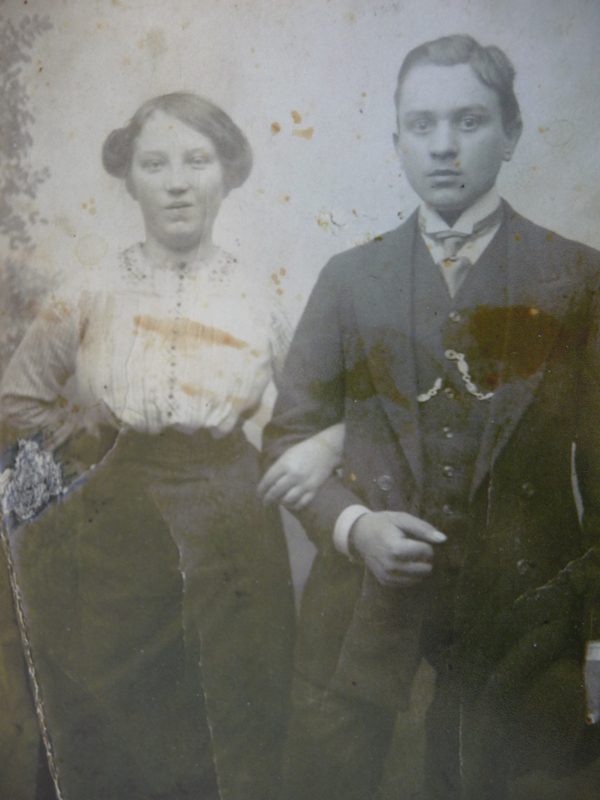 My grandmother emigrated to Canada with her first husband in 1913 — well, he came first, a year earlier… Have you been to Horni Lomna? It’s a lovely village, tucked into the Beskydy Mountains. This entry was posted on February 26, 2012 at 7:15 am and is filed under Uncategorized.You can follow any responses to this entry through the RSS 2.0 feed.You can leave a response, or trackback from your own site.